2017 is coming – and so is the need for a new calendar. Gone is this year’s calendar, covered with scribbles; gone are the big dates, counted down by preceding days. Get ready for the New Year and its new promise with our selection of the top fifty 2017 calendars. Available in watercolour, geometrics, architectural sketches or black-and-white cartoons, they add not only a new year but a new feel to your office or home environment. Tailor your calendar to your own style – by the month, by the day, as a one-page overview or in a whole new format – and see what new achievements your calendar can be filled with in the coming year. 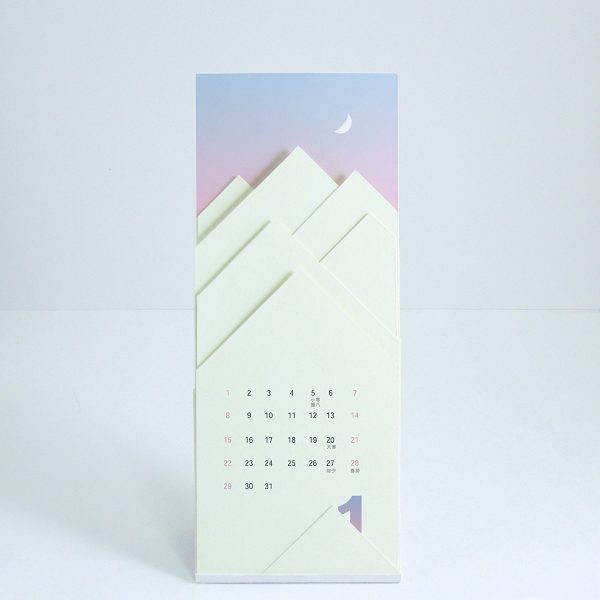 Paper Mountain Calendar: Spend the next 12 months doing origami with this interesting calendar. The end of each month peels away a layer of the mountain. Minimalist Landscape Calendar: Combine a love for travelling with a love for minimalist painting, with this calendar of many watercolours. 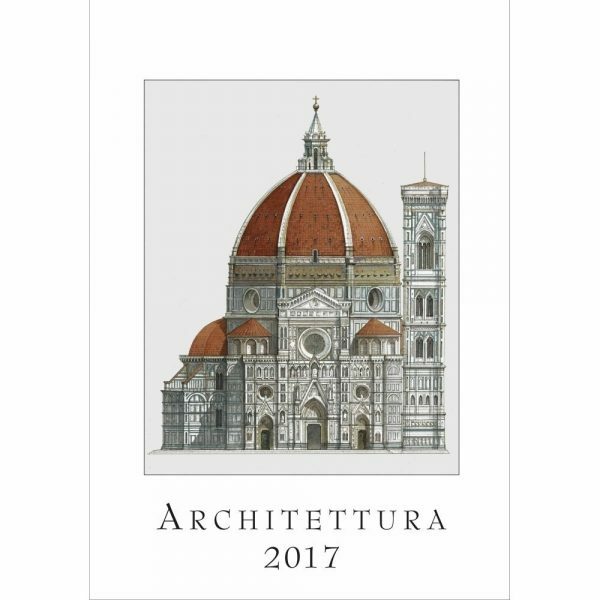 Europe Through The Eyes Of An Architect Calendar: Handmade from the States, this calendar shows all your favourite sights through the eyes of the architects who build them. Italian Architecture Calendar: Rome’s architecture is one of the world’s most historic. Learn from the ancients with this calendar for the coming year. 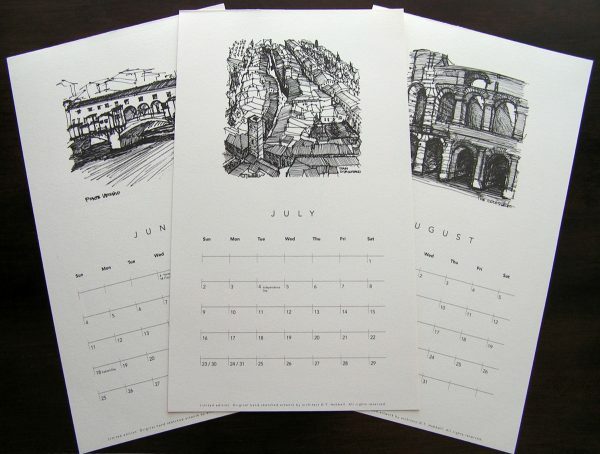 London Landmarks Calendar: Enjoy the sights of London from your desk, with this muted-tone calendar. Hang it on a clipboard for a hipster look. 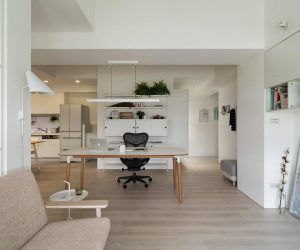 Mid-Century Modern Architecture Calendar: Architecture is not all bells and whistles. 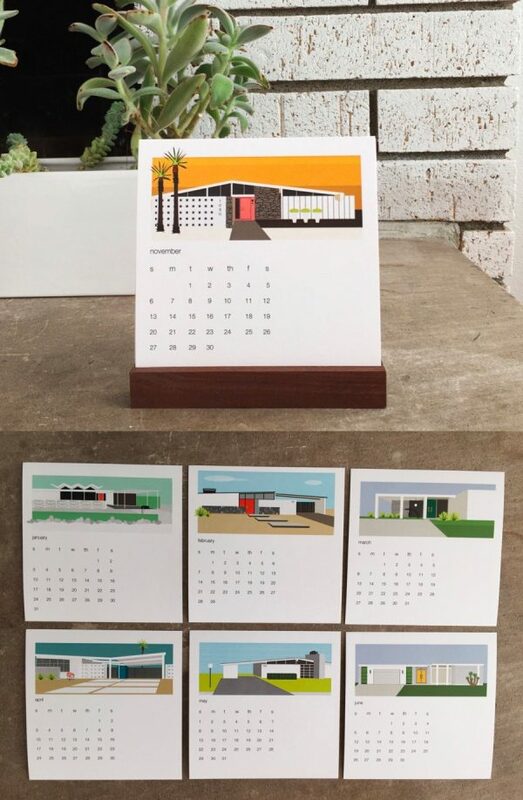 A great gift for an architect, treat this 50’s-style calendar as a Christmas gift. 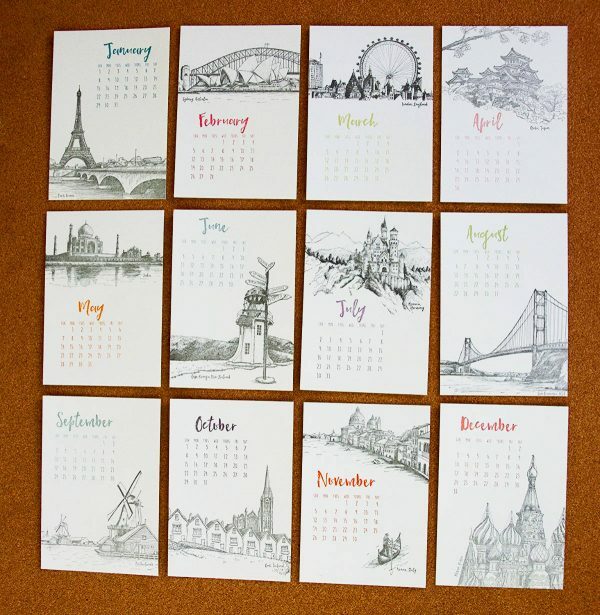 Travel Landmarks-Themed Calendar: Have a bucket list you want to fulfil? 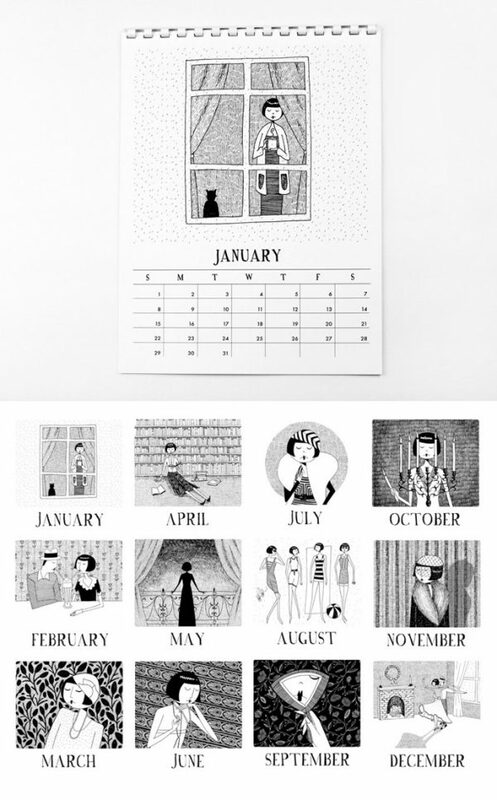 Remind yourself of your goals with this black-and-white sketched calendar, an artsy find for the home office. 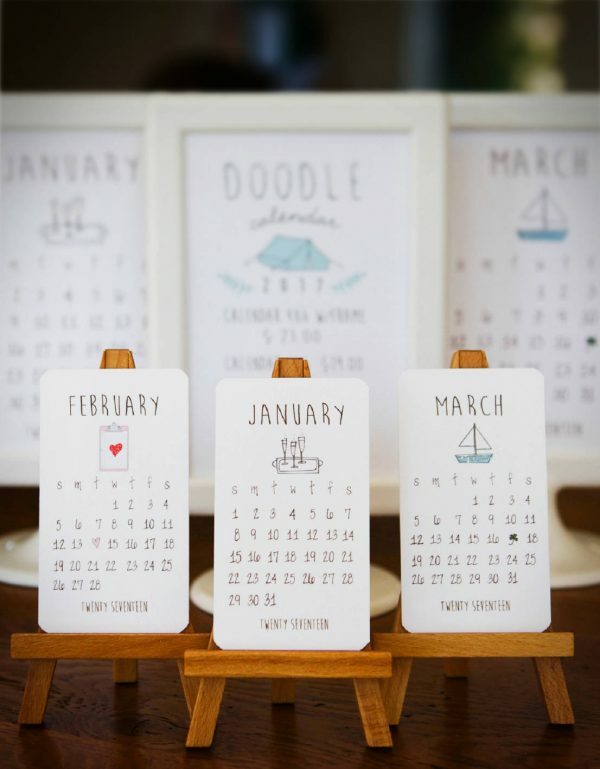 Mini Doodle Desk Calendar With Wooden Easel: Find a cute gift for that special someone with this gorgeous kitsch calendar on a wooden easel. Art Deco-Style Calendar: Follow the pursuits of a woman in style, with these art-deco illustrations in black and white. 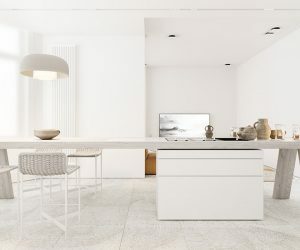 Minimalist-Style Calendar: Numbers need not always be in sans serif. 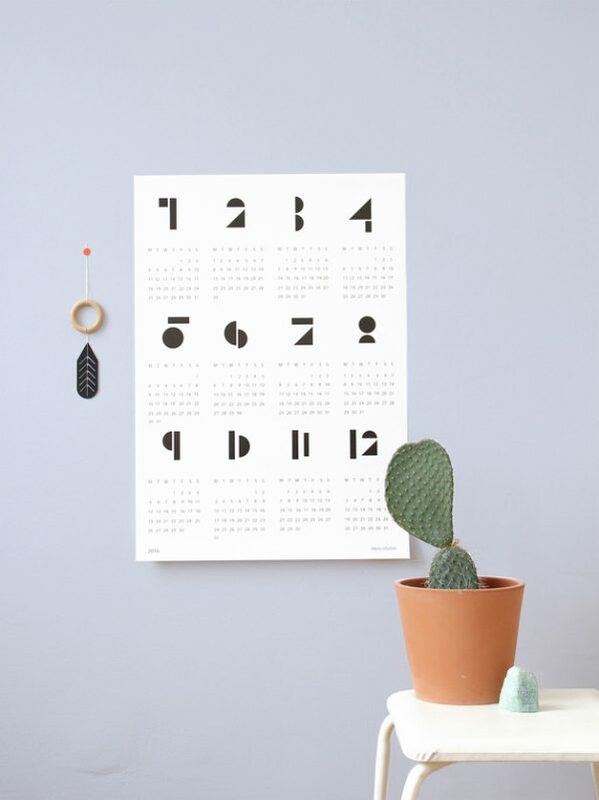 Interpret creatively, with this one-page calendar on your wall. 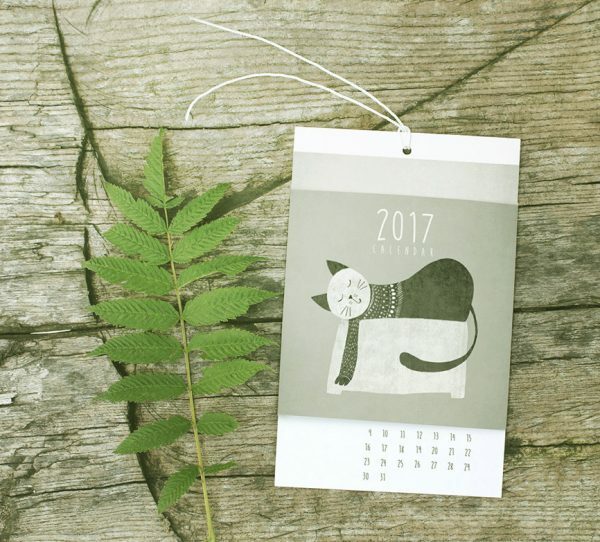 Multilayer Die-Cut Calendar: Die-cut in the middle, this calendar’s months peel to reveal a black-and-white design. Shuffle the months around to create your own centre. Topography Calendar: With each page adding a new layer to the topography, this gem of a design is just awesome on so many levels! 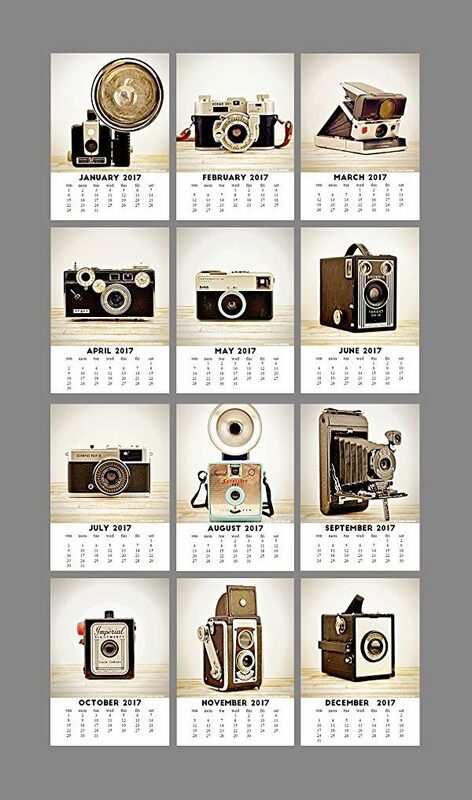 Vintage Camera Calendar: Know someone that loves photography? 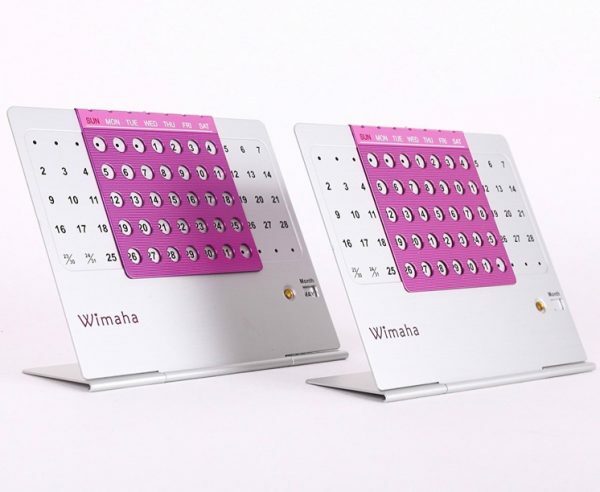 Let them see it every month of the year, with this calendar beside their home camera decor. 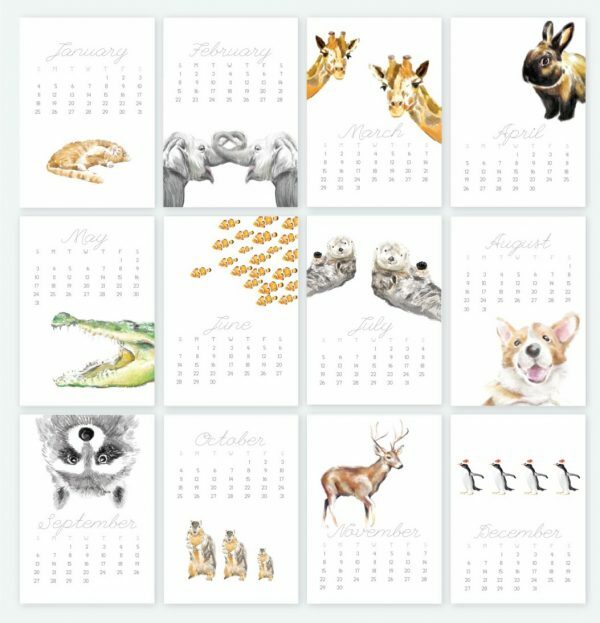 Animal-Themed Calendar: Animals never looked more hipster. These beautiful illustrations let an animalistic face peek out every month. 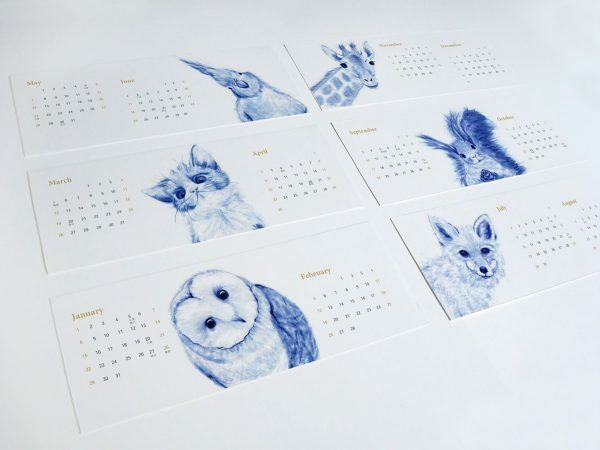 Blue-Toned Animal Calendar: Not big on colour? Create a more vintage, blue-toned feel with these inquisitive creatures. Cat Calendar: A cat lover is not uncommon. Gift the one in your life with calendared cat illustrations. 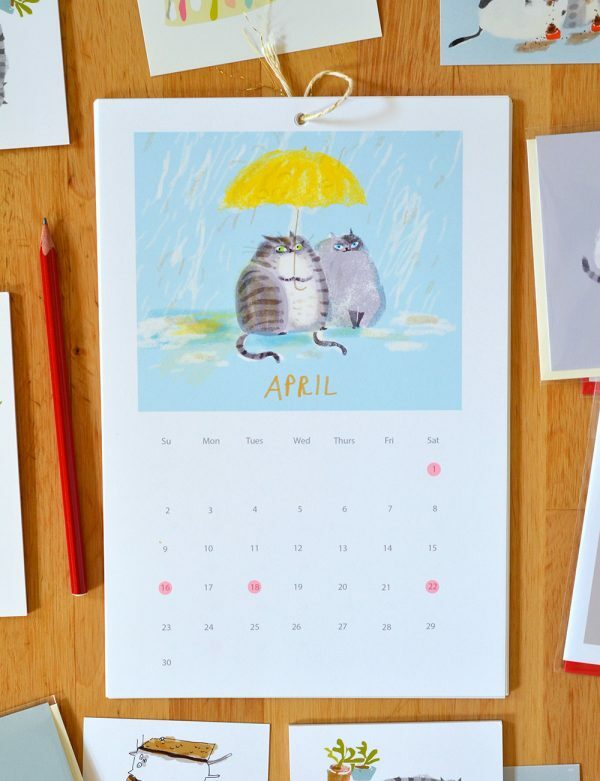 Yet Another Cute Cat Calendar: Can’t get enough of your miaowing moggy? Hang this bad boy beside some stylish cat furniture to turn up the ante. 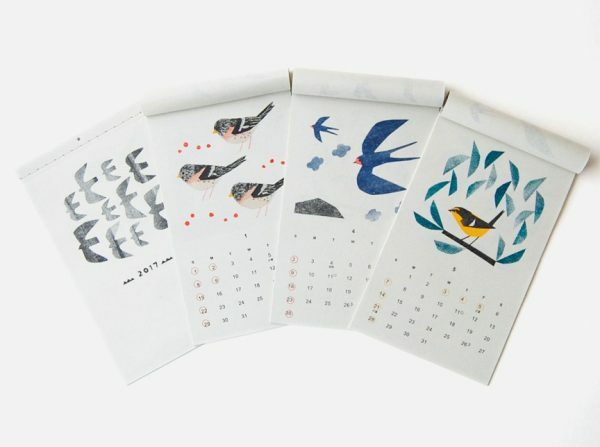 Bird Calendar: Symbolising freedom, birds inspire us all to travel more. Count down the days to your next holiday with these feather-plumed friends. 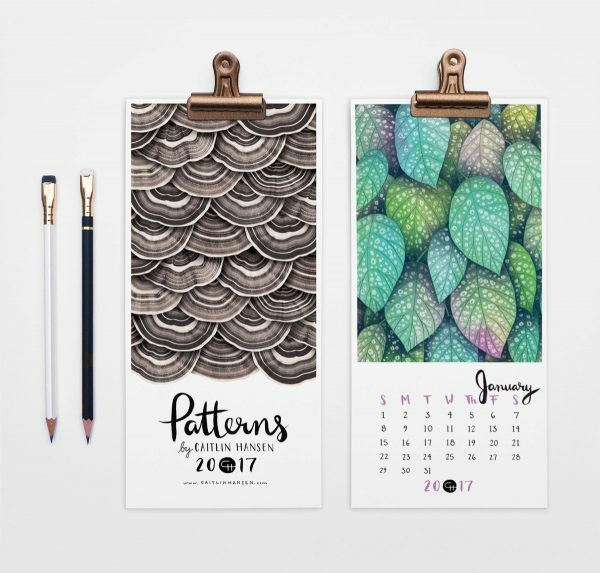 Pattern Calendar: A designer would love these patterns, a crafted mixture of black-and-white and coloured finds. 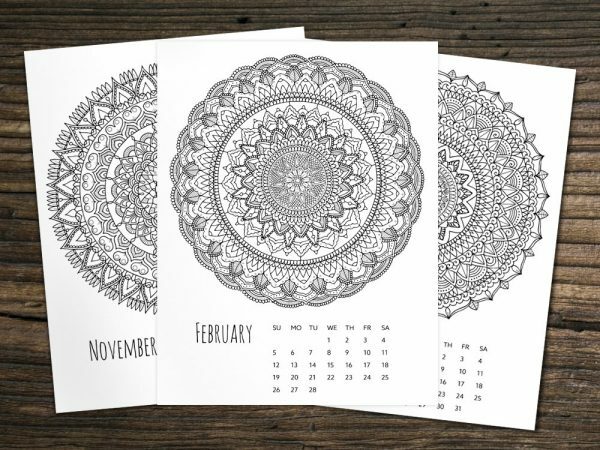 Mandala Calendars: A representation of the Indian universe, these hand-drawn mandalas serve as pretty prints after the month is through. 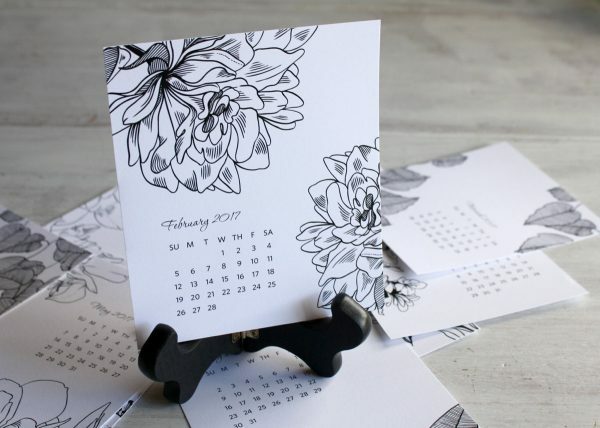 Black & White Floral Calendar: Flowers more your thing? Bring your garden inside with these months in black and white. 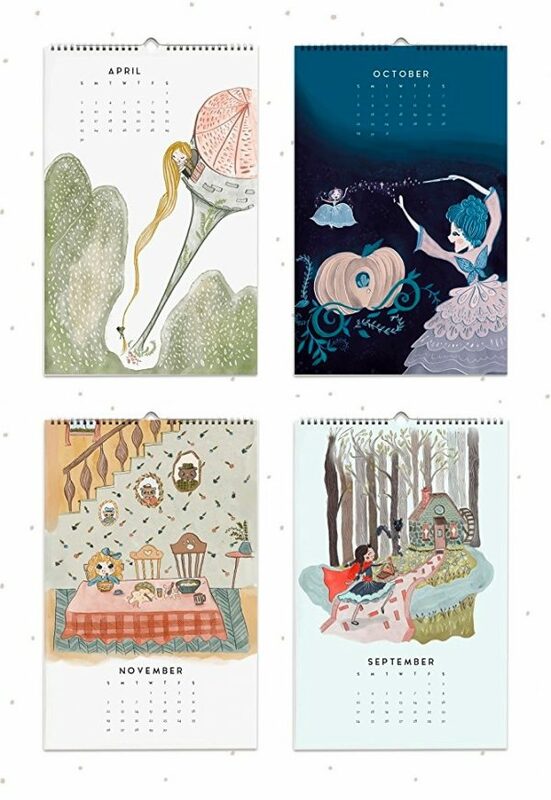 Kids Fairy Tales-Themed Calendar: Teach your kids fairytale lessons with these beautifully-illustrated, didactic tales. Personalized Calendars With Your Own Photos: Find the biggest inspiration in your own life? Sit your family around your work desk with a calendar photo of your choosing. 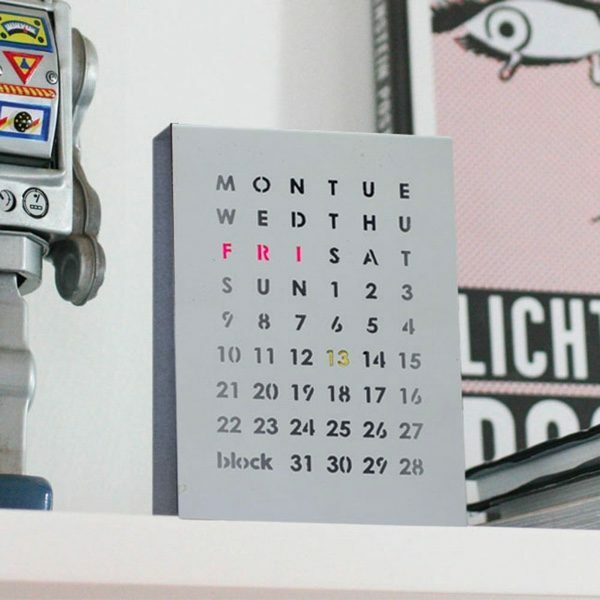 MoMA Perpetual Calendar: Tired of buying new calendars year after year? 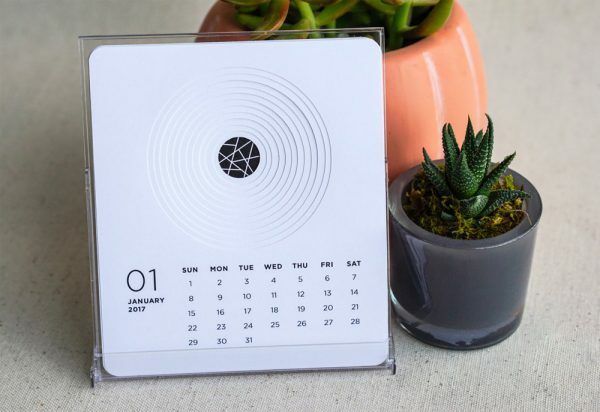 This innovative calendar by Gideon Dagan lets you pinpoint your own time and date, from a desk or wall location. MoMA Cubes Calendar: Scrabble comes to mind in this MoMA-commissioned design. Using generic figures and dates, it’ll be up to date for all eternity. 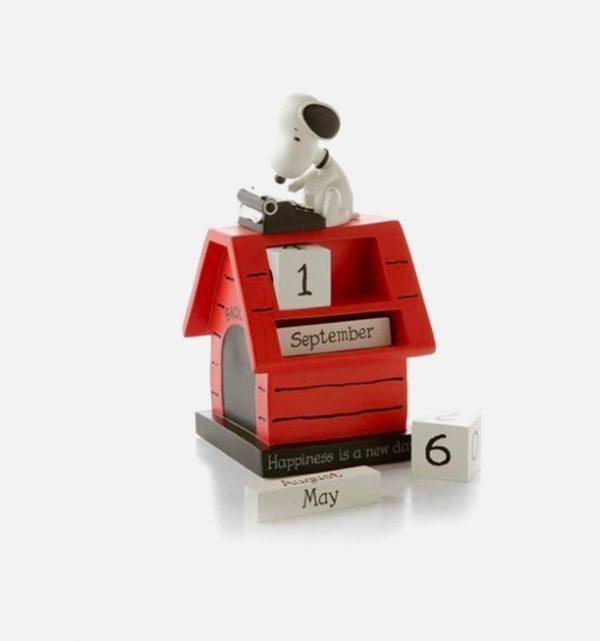 Snoopy Calendar: Snoopy watches the year roll by, atop his month and date-laden kennel. 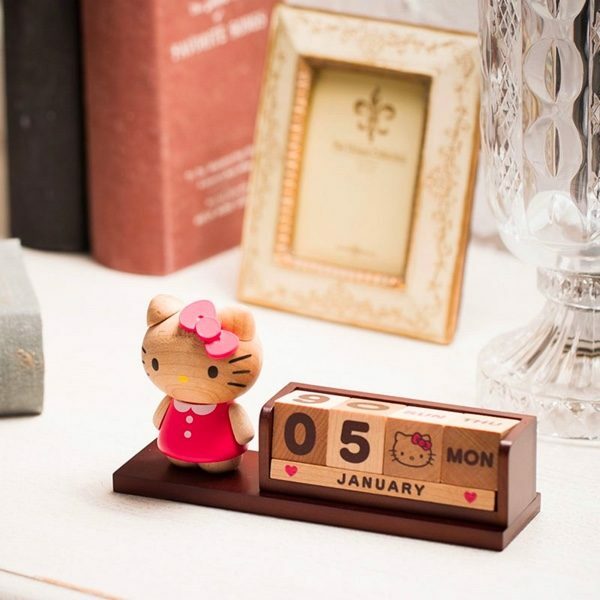 Hello Kitty Calendar: Roll over the day and month with this iconic character on your office desk. 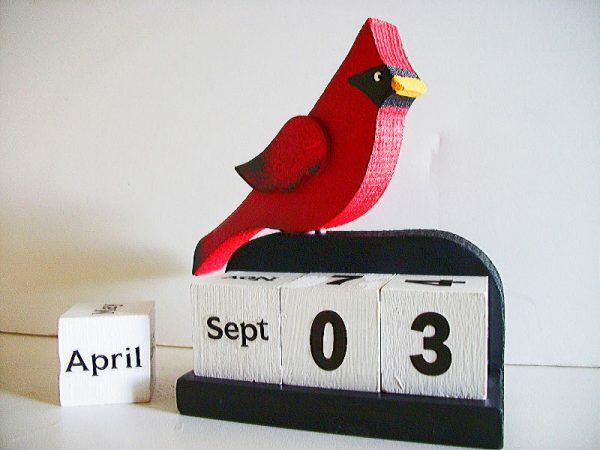 Cardinal Calendar: A cardinal bird sits above this monochrome design, easy to use and rotate with painted cubes. 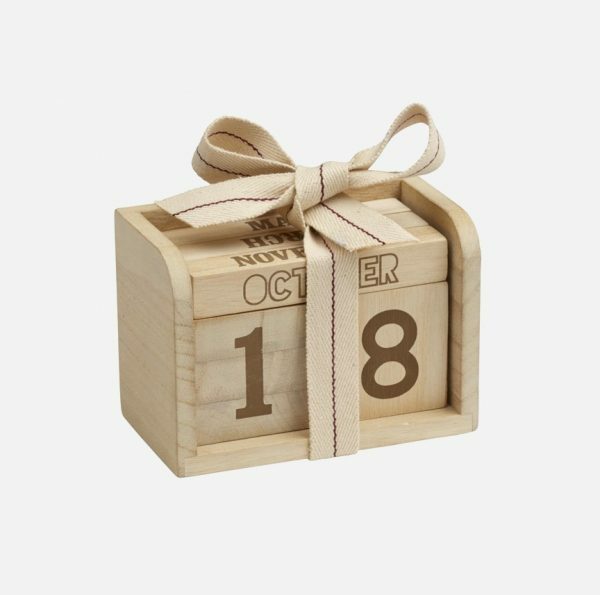 Rustic-Style Wooden Blocks Calendar: An all-wooden box holds these rustic blocks. 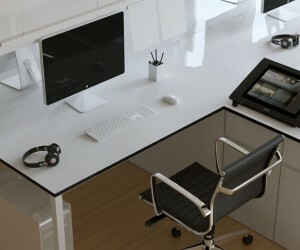 A wooden desktop would be the perfect setting. 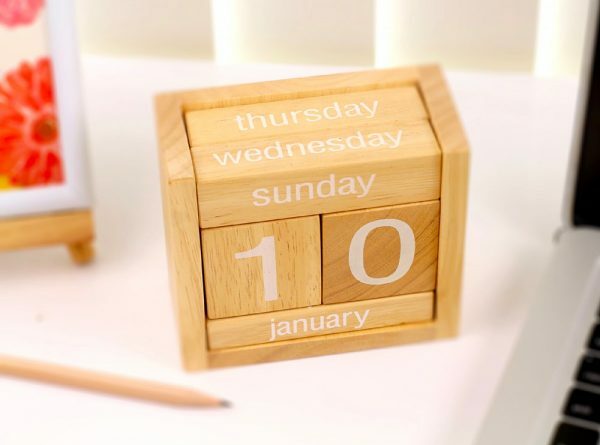 Minimalist-Style Wooden Block Calendar: Thrill the minimalist you know with this last-minute present for the office Christmas party. 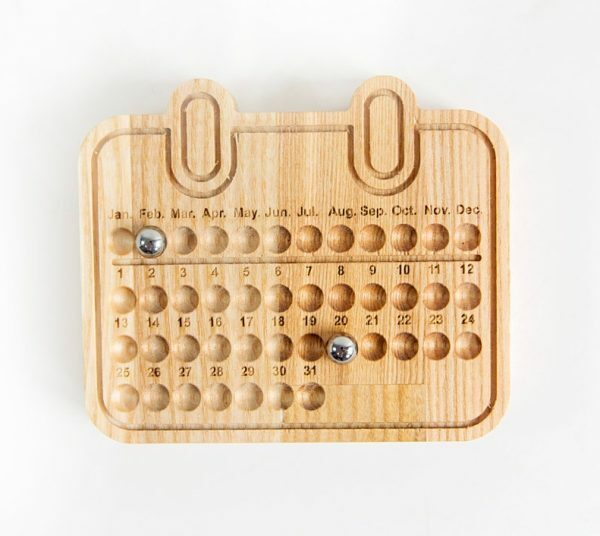 Wooden Perpetual Calendar: This unusual calendar uses grooves and balls to set the date. Place it on your office desk for a groovy conversation starter. 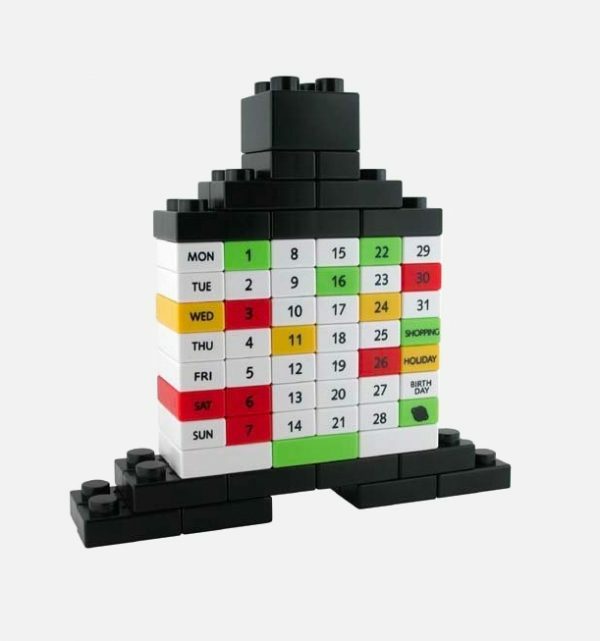 Build Your Own Calendar: A Lego set doubles as a nifty calendar, in this self-created block design. 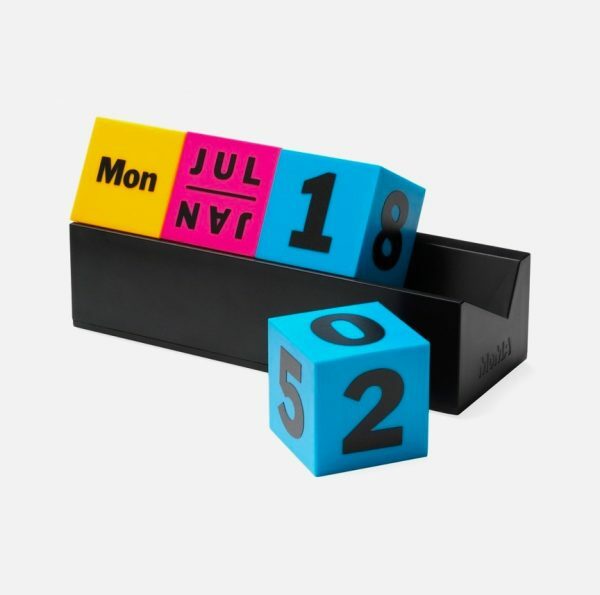 Block Perpetual Calendar: Let colours designate the time and date with this everlasting calendar. 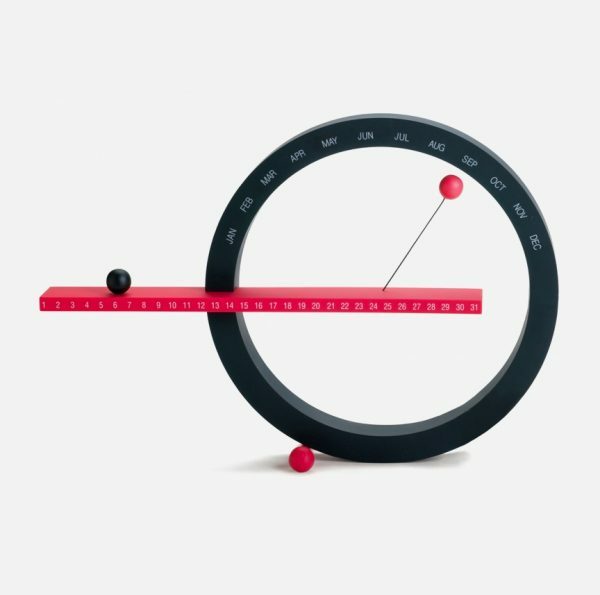 Perpetual Sliding Calendar: Need to see the whole month? This nifty purple frame outlines your next 30 days. 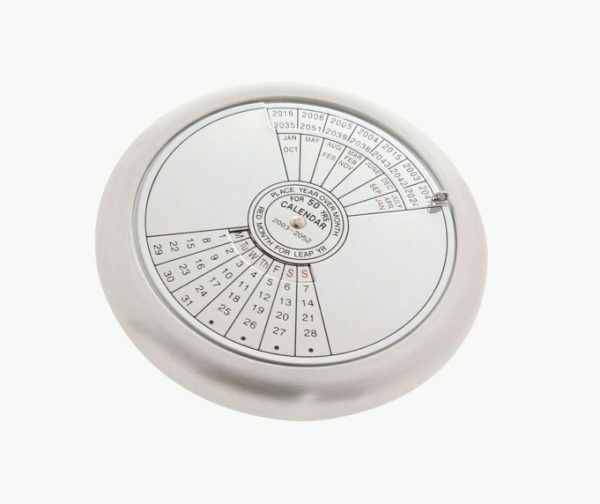 50 Year Calendar Paperweight: Be more precise with the date – for the next 50 years – with this calendar and paperweight. 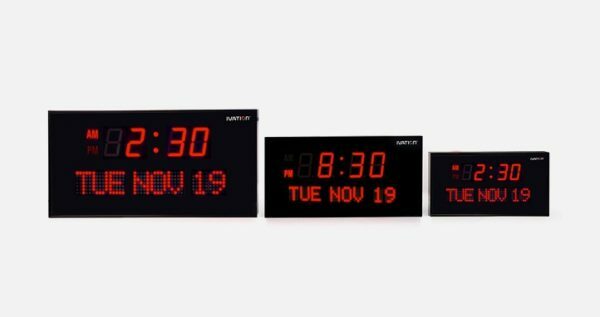 Digital Calendar Clock: Show the time and date with this unique clock on your bedside table or wall.